Breanni, one of the world's foremost collectors of exotic pets, is a neutral gnome pet supplies vendor located in the Magical Menagerie store in Dalaran. She also mails players pets awarded by completing achievements or by purchasing pets or mounts from the Blizzard store. Breanni is also sometimes seen visiting the Darkmoon Faire. When Dalaran was temporarily moved above Deadwind Pass, it caused a mess in the shop which Breanni started to clean up. She mailed players a special [Unhatched Mr. Chilly] when they converted their World of Warcraft account into a battle.net account. This non-combat pet was available from October 15 to November 10, 2009. Let me know if you need help finding anything, <class>. If only I had more room in my store, I'd take you all with me to Dalaran! Look at all these adorable animals! We're getting pretty restless in here. Any news on what's happening? What's the word on the street, <name>? I've never seen a pet with such overwhelming power before! I tried to ask it where it came from and what it wants. But all it said was "THE MERGING IS COMPLETE" and then started assaulting nearby squirrels. A hero of your stature would surely know some tricks to contain this magical monstrosity! Can you believe this Plump Turkey made it through November alive? Since all his friends have been served up on Bountiful Tables with sides of Cranberry Chutney and Spice Bread and... ooo... I'm getting hungry. But anyhow! He's all alone, now, so I was hoping you might be willing to take care of him. There simply isn't enough room left in my shop! Despite Breanni's loving care, the obsidian raptor's feral nature cannot be restrained. 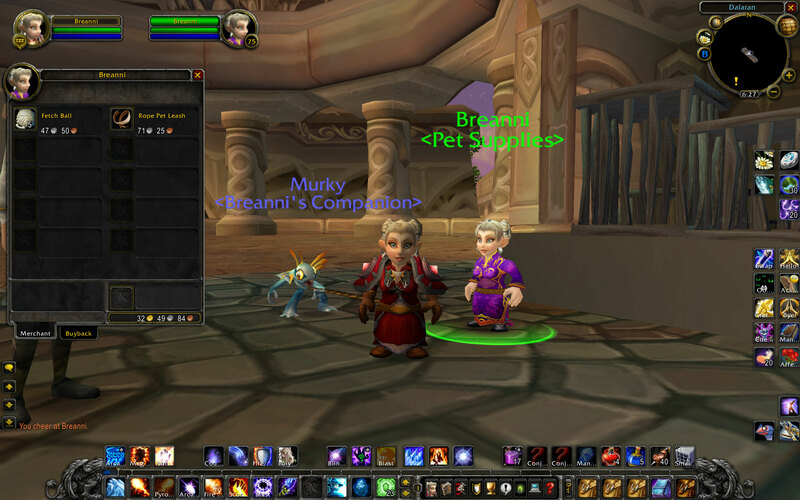 Breanni is a seller on the Black Market Auction House. The NPC is modeled after the female gnome mage Breanni, the character and nom de plume of Brian Brolin, the owner of Warcraft Pets. Patch 4.3.0 (2011-11-29): Added at Darkmoon Island. This page was last edited on 11 February 2019, at 11:51.